It's hard for me to decide whether to give the book four or five stars. It was definetiveley a very good read. The author developed the plot very well. A really intelligent and twisted plot! There were always surprises and the second half of the book was very, very thrilling. Sometimes I felt like I couldn't read any further because I was so ... horror-stricken. Really amazing. That would mean five stars. BUT in the first half ,or say maybe 40 %, I had some hard times. 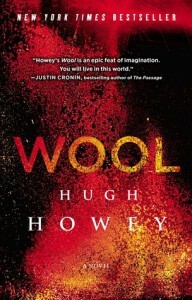 English is a foreign language to me and the writing style of Howey felt simply hard to read. His sentences so long, somehow 'standoffish'. He used many words I had to look up though I read many English books lately. The plot didn't really gain momentum for a long time. I couldn't really feel with the characters. But reading further was definitely worth it. So I'd say 4,5 stars and that means rounding up.